The top-billed actors deliver: Hanks with his resonant reserve and Newman in conveying Rooney's failed attempt to live up to his self-image as the ultimate just and loving patriarch. 111 min. DreamWorks. Director: Sam Mendes. Cast: Tom Hanks, Paul Newman, Jude Law, Jennifer Jason Leigh, Daniel Craig. Your first film is an Oscar-sweeping smash: what do you do for an encore? 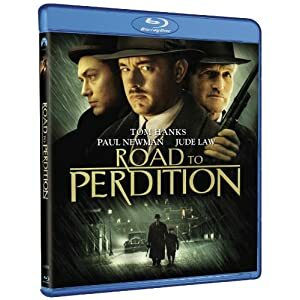 If you're director Sam Mendes, you follow up American Beauty with an adaptation of Max Allan Collins's graphic novel Road to Perdition (itself based on the anime film Lone Wolf and Cub). In doing so, Mendes mashed the themes and much of the mood of The Godfather into pulpy fiction. The twist here is that this simplistic gangland story is told through the eyes of a child. The elegant period production, however, is seen through the eyes of legendary cinematographer Conrad L. Hall, so you'd better believe that every frame—snowy, rainy, or bloody—has the requisite dark American beauty. 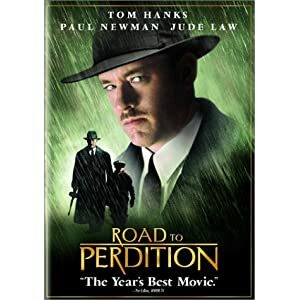 Road to Perdition doesn't have big stars; it has giant ones, in the persons of Tom Hanks and Paul Newman. Hanks plays Michael Sullivan, a Rock Island, Illinois bag man and hired gun who's earned the respect of the Irish mob, most especially the boss who raised him, John Rooney (Newman). In the winter of 1931, Sullivan's young son Michael, Jr. (newcomer Tyler Hoechlin) witnesses a murder, putting Sullivan in conflict with his adoptive father and John's biological son Connor (Daniel Craig). Sullivan realizes he must take his own son on the run; as they attempt to survive out in the cold, they're pursued by Jude Law's creepily fun-loving hit-man (and Weegee-esque crime-scene photographer) Harlen Maguire. It's often been said that adapting a graphic novel should be a no-brainer, since it's essentially a book of storyboards, and Mendes wisely retains the punchy action and stark grace of the best graphic novels. The story of two men who self-identify as fathers, each trying to protect his son without sacrificing career, is a fable of that brand of absent American father who works to provide for his family but remains emotionally inaccessible, loving through action and implication but whose masculine sense of self makes him unable or unwilling to articulate his feelings. John tells Michael, Sr.,"Natural law: sons are put on this earth to trouble their fathers," but the converse seems equally true. An inseparable concern: how career defines the man, or shames him. David Self's sketchy and predictable screenplay is bolstered more by shoot-'em-up scenarios than meaty character scenes, with only one father-son confab truly delivering the goods. So once you're over the shock value of Hanks tentatively revealing his ugly world to a child, your mind will likely drift to similar but bolder films, like The Godfather, The Professional, and Miller's Crossing, that beat Mendes to the period pulp-chic punch. Still, the picture brims with so much production value that you won't much care, and the top-billed actors deliver: Hanks with his resonant reserve and Newman in conveying Rooney's failed attempt to live up to his self-image as the ultimate just and loving patriarch. Road to Perdition walks softly, but it carries a big gun. Paramount's new Blu-ray special edition of Road to Perdition includes an overt salute to Oscar-winning cinematographer Conrad Hall, but as the film's director points out in "Sam Mendes Feature Introduction" (1:18, HD), it's the hi-def image that likely would get Hall's attention in its fine rendering of the photography in a film-like image with more sharpness and detail than previous home-video issues could muster. The delicately rendered color gets special attention to retain the muted hues Hall intended, and contrast and black level add to the black-and-white-evocative effect. The element has a few specks on it, and there's some telecine wobble that's noticeable on static shots, but on the whole, it's an excellent transfer. The disc has lots of new bonus material, but retains the original (and impeccable) commentary by director Sam Mendes, in which the director discusses all of the key subjects (the adaptation of the source material, casting, locations, etc. ), but also goes into considerable depth as to his cinematographic choices—in concert with Hall—and thematic expression. Eleven “Deleted Scenes” (22:16 with “Play All” option, SD) come with optional commentary by Mendes. Last up is the film's “Theatrical Trailer” (2:52, HD). All site content © 2000-2019 Peter Canavese. Page generated at 04/22/2019 11:58:46PM.